Qatar Airways no longer wants to own a piece of its American rival. The company said in a statement Wednesday that it's decided "not to proceed" with its plan to buy a 10% stake in American Airlines (AAL). The U.S. carrier's leadership has openly expressed its disapproval of Qatar Airline's proposal. American spokesperson Matt Miller said Wednesday that the company "respects" Qatar's decision to drop its proposed investment. "Our 120,000 team members remain energized and focused on taking care of those who entrust us with their travel needs," he said. Equity partnerships between international carriers have become common. Delta Air Lines (DAL), Air France-KLM Group and China Eastern Airlines have recently announced plans to forge such alliances. The idea is to facilitate closer cooperation so the carriers can coordinate everything from schedules and pricing to passenger amenities. However, Qatar Airways' investment proposition to American Airlines was far from welcome. American Airlines CEO Doug Parker said in a letter to employees last month that executives "aren't particularly excited" about the move. He also admitted there was little that could be done to stop it. American and other U.S. airlines, including Delta (DAL) and United (UAL), have accused state-run Qatar Airways -- along with United Arab Emirates airlines Emirates and Etihad -- of getting unfair financial backing from their respective governments in violation of Open Skies agreements. Those pacts reduce restrictions on flying to and from partner countries and ensure airlines compete free of government interference or subsidy. In July, American severed its codeshare agreement with Qatar Airways, preventing fliers from booking a single itinerary on flights across both airlines. The U.S. carrier said the agreements "no longer make sense" given its "extremely strong public stance" against Qatar Airways, Etihad, and Dubai's Emirates. 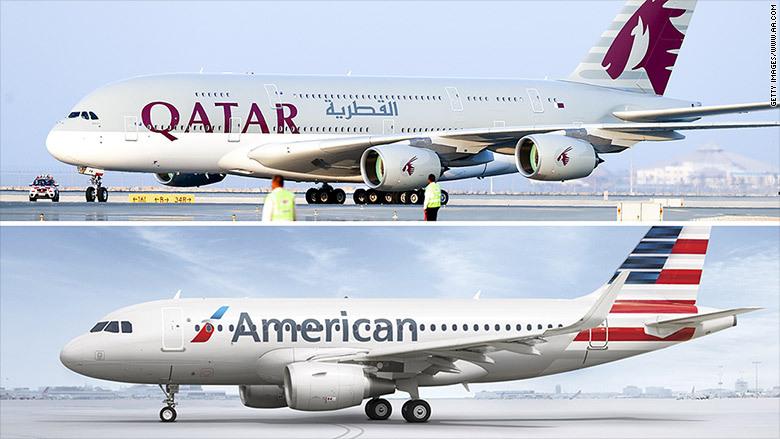 American again pushed back at Qatar in a July 12 public filing, saying if the carrier did take on a 10% stake, it would not alter American's governance structure or its plans to continue seeking fair enforcement of the Open Skies agreement. Qatar Airways said in its Wednesday statement that public filings did play a role in its decision not to continue pursuing an investment. "Further review of the proposed financial investment, taking into account the latest public disclosure of American Airlines, has demonstrated that the investment no longer meets our objectives," Qatar Airways said. It wasn't clear what public disclosure Qatar was referencing. The company did not immediately respond to an inquiry from CNNMoney. American did post its latest earnings release on Friday, and its performance was largely cheered by investors. Qatar's investment in American could have served to help block increased coordination between American and Qatar's Gulf competitors, managing director at aviation consultancy firm Aerotask, Rob Watts told CNNMoney in June. Qatar already owns stakes in International Consolidated Airlines Group (BABWF) (parent of British Airways and Spain's Iberia), and LATAM Airlines (LTM). Qatar is one of the richest counties in the world, per capita. Its state-run airway has been under economic pressure since its neighbors have sought to implement a trade embargo against the country over a political dispute. Qatar Airways can no longer fly to more than a dozen locations in Saudi Arabia, the UAE and Bahrain. An estimated 50 flights per day have been grounded. On Tuesday, Qatar filed a complaint about the embargo with the World Trade Organization.